The observations from Cassini have helped scientists better understand exactly why the moon is split into light and dark regions. The Cassini spacecraft has ended its mission by diving into the Saturnian atmosphere and becoming a part of the planet it has studied so long, but the observations and scientific data it has beamed back will continue to be studied for decades. NASA has released an image of the Yin-Yang moon of Saturn, Iapetus, captured during the final observation run of the moon. Iapetus has a portion that is unusually dark, while the rest of the moon is bright, leading to its moniker. The observations from Cassini have helped scientists better understand exactly why the moon is split into light and dark regions. The observations support the currently held theory that the Yin-Yang coloration is caused because dust falling on the surface of the moon, as well as water ice migrating from the darker regions to the lighter regions. The image is a composite of several frames, and was taken on 30 May, 2017 at a distance of 2.5 million kilometers from Iapetus. 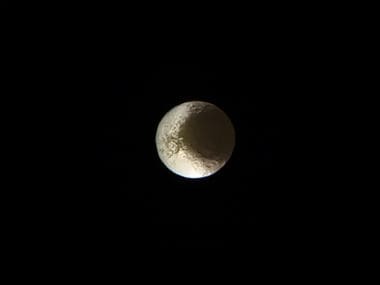 In 2007, NASA executed a close flyby of Iapetus, capturing a global map of the dichotomy of the colouring on the surface, solving the mystery of why the moon is split into dark and light regions. The moon plays an important role in Arthur C Clarke's 2001: A Space Odyssey. The science fiction writer sent a video, greeting NASA after the 2007 flyby.